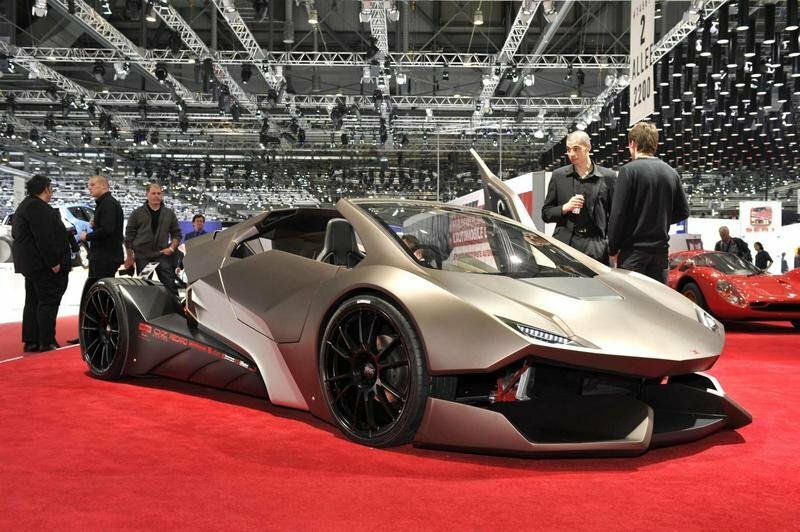 This is the Espera Sbarro Evoluzione on the Geneva floor - a concept study by a group of students from the Espera Sbarro design school in France. It took the 25 students involved in the project 13 weeks to create this design concept, inspired more by the architecture of a motorbike than an automobile. Working under four teachers, the students were split into two groups, one which worked on the drivetrain and chassis while the other was tasked with creating the overall design and styling. The cabin features a centrally mounted seat for the driver with two rear passenger seats. Three Recaro bucket seats in all. The Evoluzione rides on 20-inch wheels and is powered by a 1.8 liter turbocharged four-cylinder with 180 PS (132 kW / 178 bhp) supplied by Audi. The 'futuristic' design of the car, which somehow recalls the Batmobile from the The Dark Knight film, comes in a gray and matte black color with LED lights and black wheels.